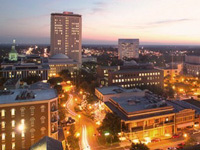 The capital city of Florida, Tallahassee is located 191 miles (308km) east of Pensacola on the 'Big Bend', close to the border with Georgia, 14 miles (23km) to the north. The city is more reminiscent of the Deep South than sunny Florida, with its fragrant magnolia trees, and old plantation houses Tallahassee hosts the Florida State University and the state's new Capitol Building, which towers 22 storeys above the downtown area. The city's five Canopy Roads, where trees form tunnels, are lined with sites such as plantations, ancient Native American settlements and mounds, gorgeous gardens, and scenic picnic spots. There is also a Museum of Natural History and Science combined with a natural habitat zoo of indigenous wildlife.